Ah, springtime! At this time of year, we burst from winter hibernation to stretch our limbs as the dawn and dew begin to flaunt a now blossoming landscape. As the temperature rises, we shed our coats and boots, and begin to trade our soup spoons and mugs for salad plates and icy lemonade glasses. Spring in the South is but a small taste of summer weather - well before the hot and hazy dog days - and gives us our first exciting glimpses of summer produce as our rotation of tried-and-true winter veggie recipes comes to a close. Right on cue, your local farmers markets begin to open up their doors after a seasonal hiatus. Keep an eye out for crisp asparagus, spicy and sweet greens, and the beginnings of juicy fruits like strawberries and blueberries. Beans, greens, and root veggies that sustained us through the winter are still sticking around, so get your fill while you can! Pick out the colorful produce that speak to your soul and your stomach - nature is telling you that these colorful and sweet plants are at their peak nutrition and ready to be harvested. Warmer weather always has us reaching for crisp, cool salad. Ring in the spring season with mix of tender, sweet and spicy greens, which you may be surprised to find need only a dash of salt and a drizzle of oil for an amazing side. Top it with other fresh, seasonal staples like asparagus, green peas or baby carrots to seal the deal! Arugula- Arugula is tender, with a strong spicy bite. This vitamin-rich green is delicious in a salad, but substantial enough to enjoy slightly wilted. Spinach- Spinach is a culinary favorite. 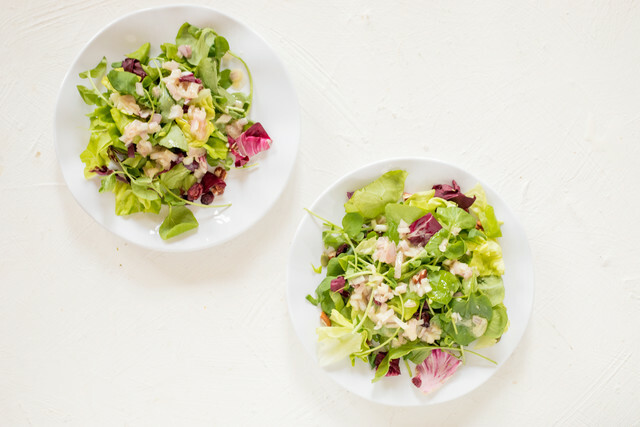 It’s slightly grassy flavor lends balance to salads. Cooked, it’s a popular addition to pastas, quiches, soups and more. To “florentine” a dish, simply add spinach! Spicy mix- Spicy mix is a beloved lettuce blend from our local farmers. True to its name, this blend has some peppery heat; arugula is a common inclusion. Many dark, leafy greens thrive in cool weather, so be sure to gather these up before the Southern heat kicks on! “Trendy” greens like kale, or a traditional Southern favorite, collard greens, can work their way into many dishes and provide folate, Vitamin C, potassium and more! These hardy greens have a slightly tough texture and bitter taste. They’re great slowly braised in vinegars until tender, or thinly sliced and served raw with a sweet accompaniment, like peanut butter or sorghum. Kale- Kale isn’t just a fad; it’s been on the menu since the Middle Ages. Numerous varieties of kale grow well in the South, from classic green to dinosaur. Mustard Greens- Mustard greens are harvested from mustard plants. Like the spice, these leaves have a bit of kick to them. Collard Greens- Collard greens and black-eyed peas is a New Year’s classic. Collards are typically stewed down with pork, though vegetarians can use seasoned or smoked salts to achieve a similar flavor profile. Tomato- Juicy, plump and slightly sweet, tomatoes can come in all sizes and colors, especially their heirloom varieties. 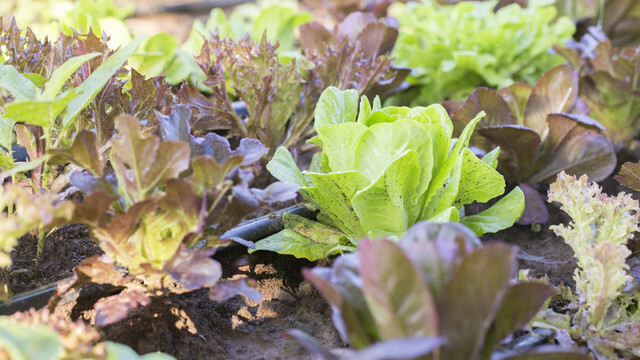 In the spring, you can expect smaller, sweet varieties that are perfect for adding a juicy pops of flavor to your salad. Potato- This humble tuber is the perfect blank slate for flavor. You can enjoy them a variety of ways, like fried, roasted, baked, mashed or in a stew. Eggplant- Also called “aubergines”, these egg-shaped fruits have a glossy, purple skin and thick, almost spongy flesh that welcomes rich, savory flavors when cooked. They are best enjoyed baked, grilled or fried. The botanical definition of a berry is a fleshy fruit produced from the flower of a plant that contains seeds… which includes unlikely subjects like tomatoes and cucumbers while excluding strawberries and raspberries. A more loose definition - the one we’re following here - defines a berry as a small, rounded fruit that can be sweet or sour and doesn’t contain a pit or stone. Strawberries- These red gems have only a short season at the end of spring and beginning of summer, so enjoy them quick once you see them at the market! Freeze any that you can’t finish for desserts and smoothies later in the year. Blueberries- Just like strawberries, gather all the blueberries while you can! Ever noticed how blueberries are actually purple? Anthocyanins, which are known for their antioxidant, anti-inflammatory and anti-cancer benefits, are responsible for that rich hue. Primarily seen as more of a summer fruit, we’re always excited to see these fleshy fruits show up towards the end of spring! They’re named for their large stone seed, and are also known as drupes. In botany, a drupe is an fruit where the outer flesh of the fruit part surrounds the shell of hardened “endocarp” ( or inner part of the shell) with a seed inside. Some varieties are cling-stone, which means you’ll have to carve the pulp away, while others are free-stone, which means the stone easily falls away from the sweet, edible flesh. All are sweet, juicy, and nectarous (like a nectarine! ), and they get sweeter as they ripen. Peaches- Our namesake, and the state fruit of Georgia. The peach can be enjoyed on its own just fine, but it’s a favorite for cobbler around these parts. Plums- These fruits have a fleshy sweet inside and glossy purple outside. We call them prunes when they’re sold as dried fruit. Nectarines- Almost identical in genetic makeup to the peach, these fruits have a smooth - not fuzzy - skin, and tend to be a bit more fragrant. Bean there, done that. Beans, peas and even peanuts fall under this category, all of which offer a wallop of plant-based protein and fiber as well as other essential nutrients like iron, calcium, and B vitamins. They’re also relatively inexpensive and easily stored, so buy in bulk and you’ll have plenty to enjoy over winter. As you plan your summer garden, keep in mind that beans are one-third of the Three Sisters, so be sure to plant them alongside corn and squash for a most successful harvest. Snap beans- Also called greens beans, string beans and long beans, this family of legumes is harvested before maturity; the entire pod is eaten while the seeds inside are still tiny and soft. Fava beans- Also known as broad beans, these legumes are an important part of Mediterranean and Middle Eastern cuisines. A time-consuming shelling process yields great, flavorful rewards. Field peas- There are many varieties of this legume, which can be considered a staple in the South. We like to simmer them with smoky ham hocks, and serve them alongside cornbread, greens and potlikker. Spring peas - After peeling back the emerald-colored inedible pod, you’ll find a row of sweet, crunchy gems that add brightness to soups, salads, and everything in between. Stock up and freeze if you don’t plan on enjoying them immediately - you’ll be happy you did after their brief season ends! Root vegetables tend to enjoy cooler weather, so in addition to being in season in the spring, you’ll often find them flourishing throughout other parts of the year! Be sure to get your fix before summer temperatures hit their peak in July and August, as they may be harder to find during those months. Radish-Radishes are crisp and peppery, perfect for salads or hors d'oeuvres. Their colors can range from red to white to striped. Turnip- Turnips are crunchy and mild, and play well with other vegetables (ever blended turnips in your mashed potatoes?). Turnip greens, the leafy tops, can be reserved to use in other dishes, giving you the most bang for your buck. Beets- Beets are deeply nutritious and colorful. They are even used to make organic dyes! 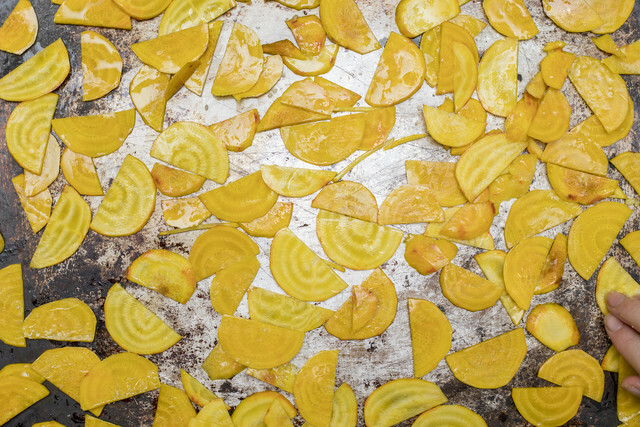 Beets are one of the few root vegetables that you really should peel- their peel tends to be tough and holds a bit of dirt. Carrot- Carrots are one of the ingredients in mirepoix- the French base for cooking. Their sweet, earthy flavor balances a number of dishes. Of course, raw carrots are a delicious snack! Asparagus - This veggie makes a brief, but much anticipated appearance during the spring - so don’t wait to pick some up next time you see the flashy green and purple stalks at the market! Did you know that asparagus takes about three years to grow from seed to harvest? Cabbage- Cabbage’s large leaves make beautiful rolls. This leafy vegetable is very dense and tightly packed, making it a great choice for feeding a crowd. It prefers cooler weather, so you’ll also be able to enjoy cabbage during the fall and winter months. Mushrooms- The only fungi on this list, mushrooms have been used medicinally and in culinary preparations for thousands of years. They provide intense savory flavors to recipes, giving vegetarian meals an umami punch to make them more satiating. If you love mushrooms as much as we do, you’ll be pleased to know that they are available year-round! Basil- The “King of Herbs” is commonly used in Mediterranean and Eastern cuisine for its bold, sweet, slightly anise-like flavor. It’s the main component of traditional pesto. Green Garlic- Harvested young in the spring season, green garlic somewhat resembles scallions and is much milder in flavor than mature garlic cloves. They’re different than garlic scapes, which grow out of the top of the garlic plant as a curly shoot later on into the summer season. Ramps- This elusive, wild edible and Appalachian delicacy is known for its bold, decadent flavor and strikingly small window for harvest. If someone offers to take you to their secret spot for foraging ramps, you'd be a fool to pass up their offer! Because we collaborate with our local farmers who harvest and deliver their produce just days before it arrives on your doorstep, you'll find the only the most seasonal fresh ingredients in your meal kits! Enjoying a year-round variety of what the South has to offer is both delicious and exciting (and healthful, too! ).